Will the Last Line to Leave Turkey Please Turn Out the Lights? The brands of Norwegian Cruise Line Holdings - Norwegian Cruise Line, Oceania Cruises and Regent Seven Seas - said today they were suspending all calls at Turkey through 2016. The complete story appeared in the January 22 edition of Cruise News Daily. Royal Caribbean International is delaying the turnarounds of two ships in the Northeast (US) this weekend due to the snowstorm burying the region under tons of snow. Grandeur of the Seas will now turn around Monday (instead of Sunday) at Baltimore, and Anthem of the Seas will delay its turnaround at Cape Liberty (Bayonne) until Tuesday (instead of Monday). Details appeared in the January 22 edition of Cruise News Daily. Here is a video clip of Royal Caribbean Cruises' chairman, Richard Fain, talking yesterday on Bloomberg about their experience in China with the Royal Caribbean International brand. MIAMI, Jan. 22, 2016 -- Royal Caribbean Cruises Ltd. (NYSE, OSE: RCL) today announced the appointment of Renee Guttman as Chief Information Security Officer (CISO), effective January 25, 2016. "Renee's role is paramount as Royal Caribbean continues to work in a global environment where information security is critical to the ongoing success of our Company," said Michael Giresi, Chief Information Officer, Royal Caribbean Cruises Ltd. "Information security touches every aspect of our business and Renee's leadership and oversight will innovate RCL so that our information and systems are protected and in compliance with global regulations." Guttman is an accomplished global information security and privacy executive with a proven track record of establishing internationally-recognized information security programs for Fortune 500 companies. Guttman was most recently Vice President of Information Risk and member of the Office of the CISO at Optiv, where she provided guidance to security leaders at enterprise-class organizations. Prior to this, she served in information security and privacy executive roles at Coca-Cola Company and Time Warner, Inc.
Norwegian Cruise Line today revealed plans for a two-year program that will eventually enhance all facets of the customer experience - the ships, the culinary experience and the private destination experience. Essentially what seems to be happening is that the line is making the experience on their entire fleet feel much like it does on their newest ships. They are also carrying that through to their private destinations in the Bahamas and Belize to give them more of a resort feel, and tying it all together under an umbrella they are calling “Norwegian Edge.” They have put a price tag on the program of $400 million. The complete story appeared in the January 21 edition of Cruise News Daily. When Holland America’s Eurodam returned to service after a two-week refit just before Christmas, it came back with a couple of new entertainment options, a new lounge and an upgraded restaurant. Eurodam’s suites were also the first in the fleet to undergo the fleetwide upgrades announced in November. The complete story appeared in the January 20 edition of Cruise News Daily. Another cruise line has thought over last week’s terrorist attack in Istanbul and decided it would be better to bypass Turkish ports for now. MSC said today that it will suspend all calls in Turkey indefinitely. Details appeared in the January 20 edition of Cruise News Daily. 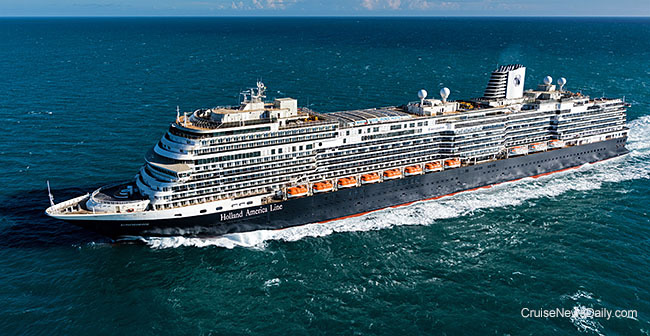 A sure since that delivery is nearing, Fincantieri took Holland America's Koningsdam out on its second set of sea trials in the Adriatic last week. It was the first opportunity to really look over the new class of ship. The complete story appeared in the January 19 edition of Cruise News Daily. By courtesy of FINCANTIERI S.p.A. All rights reserved. May not be copied or used without express permission. Queen Mary 2 arrived at New York on Sunday morning from Southampton, at the end of the first leg of its world cruise, and it had an extra passenger aboard. It wasn’t some poor soul picked up along the way whose boat was sinking. That’s old hat for QM2. This was a brand-new occurrence for the giant ocean liner. Imagine going to a major sporting event, like the World Series, by cruise ship. Midway through the five-day cruise, it stops at the port for the games. You and a couple thousand other people spend two days at the games using the ship as your hotel, and then you sail home. You unpack once, you have wonderful dining and entertainment available just outside your door, and your tickets to the games and shuttles to the stadium are all prearranged. What could be simpler? Just a dream? No. P&O Australia is doing that right now for the Australian Open Tennis matches. Details appeared in the January 19 edition of Cruise News Daily. Most of the seasons are reversed between North America and Australia, but one that isn’t is Wave Season. It starts both places in early January and cruise lines are flooded with bookings. We often use term “exploding” to describe the Australian market, and it seems at the moment that term couldn’t be more accurate. As we’ve been reporting, P&O Australia has just added two new ships, and they have energized their market even more, and P&O has broken a couple of booking records already this year. Details appeared in the January 18 edition of Cruise News Daily. On of the major places to visit on any trip to Amsterdam is the Rijksmuseum. In April, a little bit of it will be coming to Holland America’s Oosterdam. The complete story appeared in the January 18 edition of Cruise News Daily.